We also need to know the perameters of time. Are we speaking of stations used by the MBTA or stations used by Commuter Rail in Massachusetts ? There are many abandoned stations (Mount Hope, Hazelwood, Forest Hills RR #1, etc. etc.) that weren't part of the MBTA/MTA/ or BERy. I'm pretty sure I've seen Mount Hope and Forest Hills commuter rail stations on 1970s (pre-Southwest Corridor) MBTA maps. All that you say is true. Trains to Reading could only use F10's until the awnings at Oak Grove and Malden were cut back, and the roof of Wellington Tunnel was raised. The F40's would not fit. In fact, the trains ran around tunnel while the clearance work at the tunnel was ongoing. octr202 wrote: Mike - I believe you're right. I remember hearing somewhere else that the only reason that Malden and Oak Grove have full length high's is that those were to be subway tracks, not railroad, and some modifications had to be made to clear railroad equipment. I'm sure plenty of folks can confirm this, but wasn't the original intent for the railroad tracks to only go as far as accessing the Medford branch, thus the railroad today uses what was intended to be Orange Line tracks from that point north. I would assume the commuter rail tracks would not have been sent through the duckunder if they had been intended to remain as railroad and not subway. Ron Newman wrote: I'm pretty sure I've seen Mount Hope and Forest Hills commuter rail stations on 1970s (pre-Southwest Corridor) MBTA maps. I'm sure you did... I'm looking at one at the moment. Mount Hope and Forest Hills were definitely in use through the late 1970s, although in the case of Forest Hills it was thanks to what turned out to be a temporary service restoration after a couple decades of disuse. For example the MBTA/B&M commuter timetable dated June 25, 1978 shows one inbound weekday train and two outbound weekday trains stopping at Mount Hope, and all Needham Branch trains stopping at Forest Hills. (Only the Needham track had a passenger platform at that point.) This all ended in 1979 when the mainline through both stations was shut down for the construction of the Big Ditch. Sounds like pretty good evidence to me ! I remember both "stations" at this time. In the case of Forest Hills, the most western track (Needham Line) abutted the remaining platform. There was no shelter, the paving was cracked and had large gaping holes - it was a mess ! Mount Hope had had an arson fire in the 1940's. This was another "stop that wasn't". Aside from a platform in bad condition, the steps to Blakemore Road were steel, but they had to place wooden timber to make steps on the Florence Street (outbound) side ! Anyway, good work Tom and Ron ! 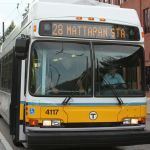 jbvb wrote: The North Andover stop wasn't reinstated when Haverhill service was restored for two reasons I can think of: First, it wasn't much more than a mile from the old Lawrence station. Second, trains that stop would block Sutton St., possibly enough to interact with the then-daily jam on 495 where it narrowed down for the Merrimack River bridge. Shawsheen was also rather close to Andover. My company rented in the building there after it was converted to offices in the early '90s, and at that time the MBTA said they would reinstate the stop if somebody else paid to repair the station. We never found out exactly how much work they had in mind, but now it would be very impractical due to congestion on the single track. My understanding on North Andover was that the town didn't want to pay into the MBTA system at the time IIRC. And I don't think the original platform went as far west as Sutton Street. The single-track issue for Shawsheen also applies for Andover, and they turn a train in Andover which ties up the railroad. Don't think single track territory is the reason that Shawsheen isn't a stop. The Ashland and Westborough stations used to be right in the center of town, and I believe the old station sites are there. When they extended the Framingham line to Worcester in 1994, I think the line originally just went directly from Framingham to Worcester, and the in-between stations were added in later. But instead of using the old sites, they just built new ones in places that are not easily accessible via walking at all. Though I would like to know, exactly when did those old stations stop being used, and why didn't they use them for the "new" stations? I'd ask the same question about Kingston and Plymouth and Middleborough. ssetta wrote: Though I would like to know, exactly when did those old stations stop being used, and why didn't they use them for the "new" stations? The answer to the first question is the early 1960s, when the New York Central was making significant cutbacks in passenger service all across its system and closing many stations. By the late 1960s, the one weekday commuter train that continued west of Framingham ran express to Worcester, and that was the case until local service west of Framingham was (temporarily) discontinued. As for the second question, I'm not familiar with the local details but the answer almost certainly involves the availability of real estate and parking. Closed stations were mostly sold off -- the Ashland station became a pub and I believe that Westboro housed a veterinary clinic -- and were thus no longer available to the MBTA when service was restored. TomNelligan wrote: I'm not familiar with the local details but the answer almost certainly involves the availability of real estate and parking. Closed stations were mostly sold off -- the Ashland station became a pub and I believe that Westboro housed a veterinary clinic -- and were thus no longer available to the MBTA when service was restored. Unfortunately, that's the answer to 90 % of the question of availability of railway, particularly street railway, prior ROW's and facilities, now when we need them. Sad. But even if the station building was no longer available, why didn't the T put the new stop in the same place as the old? The Kendal Green station in Weston is now a private residence, for example, but the train still stops there. Service to Kendall Green has never really ever stopped... I am sure the reasoning for relocating new stations is the availability of land for parking. Since when? I don't know of any station stop in Weston. Is this on the Framingham/Worcester line? Unless you mean Wellesley Farms, which may actually be in Weston. *EDIT* Nevermind, I looked on the map, it's on the Acton/Fitchburg line. However, if you look on Google Maps, they actually have names of local Commuter Rail stations, and there's one on the Framingham/Worcester line that says "Weston (Under Const.) Station." It's right before it goes away from the Mass. Pike (headed Outbound), right near those industrial buildings. Did they ever plan for this?